As a start up business copywriter, trainer, and all round wordsmith Mairi Damer approached us to create a strong visual identity and to design and build a website that would help to get her new venture off to a flying start. 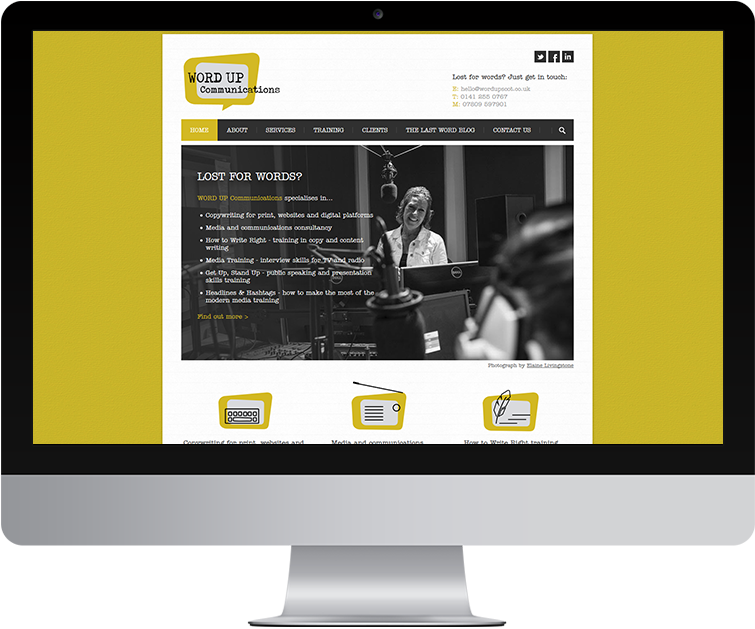 We designed and built Word Up Communications – a content managed website that makes it easy for Mairi to login and manage page content, event listings, and add content to ‘The Last Word’ blog. A few years down the road and with Word Up firmly established and doing well we refreshed the design to bring the look up to date. Here at Word Up, we are fully paid up members of the Infinite Eye fan club. We’ve worked together since Word Up was in its infancy, and right from the start we were chuffed with the collaborative and supportive approach the guys took to the design and build of our business brand. They developed our funky, user-friendly website, designed our logo and colour scheme, and and have always kept us right, no matter the daftness of our idiotic tech questions. More recently, IE have refreshed the Word Up website and created a fantastic, easy-to-use template for our Spread the Word newsletter. Our clients absolutely love the Word Up look, and we just love team Infinite Eye. Word Up needed a logo that captured the personality of founder Mairi Damer. It had to be vibrant and unique, while suggesting a little of what Mairi does. We took a lead from retro imagery and colours and crafted a logo in bright yellow with a typewriter font bringing in a retro vibe.